People come to Lake Austin Spa in Texas' legendary Hill Country for many different reasons. 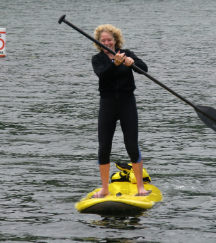 I'm here to learn stand-up paddleboarding, a sport similar to surfing, because you ride standing up. People come to Lake Austin Spa in Texas' legendary Hill Country for many different reasons. I'm here to learn stand-up paddleboarding, a sport similar to surfing, because you ride standing up. In surfboarding, you want the waves to carry you in, but with paddleboarding, you can do it on a lake or river because you propel yourself forward (or backwards) by paddling. Stand-up paddleboarding originated in Polynesia and then moved to Hawaii, just like surfing, Sandy, the paddle-boarding instructor tells me. One of the reasons I have chosen to learn the sport at this spa is because my massage, which I've booked for an hour from now, is only a three-minute walk. If you want to try it, find out where you can take a lesson. "Just think of your body as headlights," says Sandy, standing on a board beside me. "You have to stay forward, because if you turn sideways you'll fall right into the water." This is not a good day to be capsizing because the lake is only 60 degrees and the winds are gusting to 35mph. But I'm not going to quit. Besides, it's killer workout: you bend your knees the entire time so it's like one continuous squat, and it's also great for upper body with all the switching. Soon, I'm flying down the lake. We turn to go back but now we're against the wind, and my board bobbles up and down in the rough water. "Get on your knees," Sandy says. "You'll be able to pull harder with your arms." I get down and stroke though the wind keeps blowing us backwards. My arms ache. Finally we reach the dock. I haven't capsized! I guess in my next life, I'll come back as a gondolier.